Umbria offers fascinating sceneries and you need only travel a few kilometres to reach cities rich in art and culture and places of unspoilt wilderness. There is a long list of places you can visit in a day trip. Take time to get off the beaten tracks discovering hill-top medieval villages, lakes and rivers, silent hermitages and mountains popolated by ancient legends. 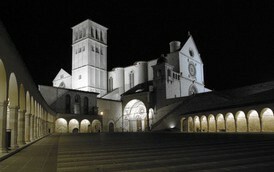 Assisi was the birthplace of St. Francis who, in 1208, founded the Franciscan religious order in the town. The town is dominated by two medieval castles. 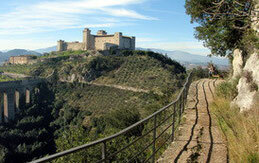 The larger, called Rocca Maggiore, has a massive presence originally created to intimidate the people of the town. It was built by Cardinal Albornoz (1367). 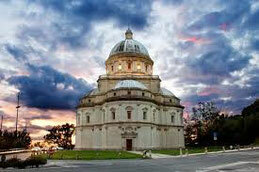 The Basilica Inferiore of San Francesco d'Assisi has frescoes by the late-medieval artists Cimabue and Giotto. 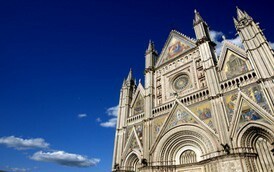 Orvieto is one of the most characteristic towns of the region. It is famous for its cathedral and the "Pozzo di San Patrizio", a historic well built by architect-engineer Antonio da Sangallo the Younger of Florence, between 1527 and 1537. The name was inspired by medieval legends that St. Patrick's Purgatory in Ireland gave access down to Purgatory, indicating something very deep. 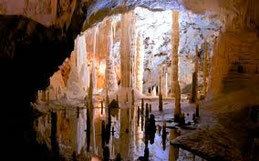 The cylindrical well is 53.15 metres (174.4 ft) deep with a base diameter of 13 metres (43 ft). There are 248 steps and 70 windows provide illumination. 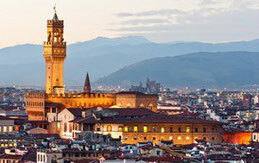 is one of the loveliest and most renowned cities in Italy, declared a UNESCO World Heritage site. 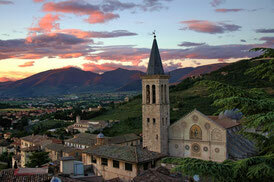 The city occupying a striking hillside position, is home to a host of fine roman and medieval monuments. 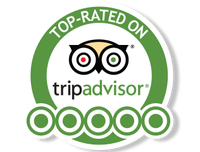 It enjoys an international reputation thanks to the Festival dei Due Mondi - one of the most prestigious art festivals in Europe since 1958. Click here to see suggestive images of past editions. 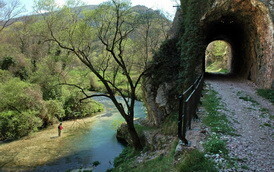 Because of its unique medieval bridge that connects the historic center directly to the mountain, visitors can walk right into nature in 5 minutes, with no need for a car. 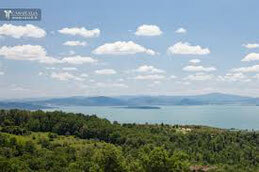 Lake Trasimeno is one of the largest lakes in Italy, between Umbria and Tuscany. It’s a true natural paradise with 3 islands (boat trips) home to wild ducks, cormorants, kites and kingfishers. Beyond the downward slope, gentle hills form the backdrop to the lake, along with vineyards and olive groves. Several town are located on the Lake, the most important ones are the medieval village of Passignano and Tuoro, an ancient Etruscan city that became well-known as the battleground between Hannibal and the Roman Caio Flaminio. Spello, a charming stone town 8 kms away from Assisi, it is a sort of valuable book composed of many pages of which to browse quietly. Starting from the south (the area of "Borgo") climbing up to Porta dell’Arce (the "Belvedere"), you can visually cover the history of a place where you can breathe in the ancient Umbrian, Roman, Medieval and Renaissance presence. On top of a medieval tower attached to the gate, stands an olive-tree, symbol of peace and of the more typical local product, the extra virgin olive oil. "A wild world of fantasy, the land of fairies, sorcerers and demons ..." the Sibillini mountains were painted as a legendary place in Europe during the Middle Ages. The breathtaking plateau called Piangrande is dominated by the Mount Vettore (2476 mts), here in June and July don't miss a photographic tour of the amazing alpine flowering. In the park you can practice many activities like mule and donkey riding, biking, climbing, trekking and cross country ski in Winter. 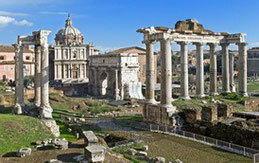 Rome's history spans more than two and a half thousand years, since its legendary founding in 753 BC. Rome is one of the oldest continuously occupied cities in Europe. It is referred to as "The Eternal City", a notion expressed by ancient Roman poets and writers. 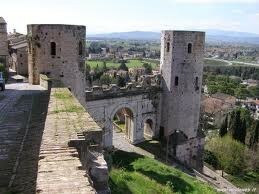 Rome is very well connected to Umbria, in 1 hour and 30 mins/ 2 hours can be reached by train or car. A centre of medieval European trade and finance and one of the wealthiest cities of the time, Florence is considered the birthplace of the Renaissance, and has been called "the Athens of the Middle Ages". Tuscany is on the North of Umbria, well connected by highway or train. Perfect destination for a day trip departing from Umbria, you won't take more than 1 hour 30 mins / 2 hours to reach Tuscany by car from the central areas of Umbria. Todi is a town perched on a tall two-crested hill overlooking the river Tiber, commanding distant views in every direction. Richard S. Levine, a professor of architecture at the University of Kentucky, chose Todi as the model sustainable city, because of its ability to reinvent itself over time. Almost all Todi's main medieval monuments, including the co-cathedral church (Duomo), front on the main square on the lower breast of the hill: the piazza is thus one of the most picturesque in Italy and is often used as a movie set. Bevagna is a medieval town famous for its wondeful square overlooked by the gothic Palazzo del Consoli, the site of one of the smallest theatre in Italy. It has roman origins, visitors can admire the remains of the Roman theatre and the thermal bath, dating back to 2nd century AC. 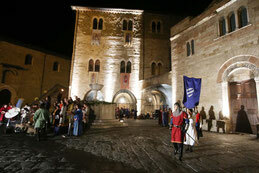 If you visit Umbria in June, you can’t miss the Mercato delle Gaite, a beautiful reproduction of scenes of Medieval life and ancient arts such as paper or glass manufacturing, book binding, weaving and wrough iron. At easy walking distance from Spoleto center is possible to reach the Ponte delle Torri (Towers Bridge), a spectacular medieval aqueduct 80 metres high that connects the upper part of Spoleto to the surrounding hills, woods and mountains following the "Saint Francis Footpath" and the scenic promenade called "Giro dei Condotti" (Acqueducts). This easy footpath on the boarder of the forest has wooden benches and tables for a panoramic picnic. Lake Bolsena is formed in the crater of an extinct volcano, its crystal clear water teem with fish and lap against fine sandy beaches. 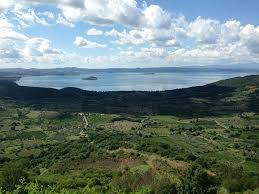 The capital of Lake is Bolsena itself, a beautiful resort town. Once the Etruscan settlement of Volsini and medieval "town of miracles", it is famous for its gardens and annual flower festival. Surrounded by archetypal villages,the area around Lake Bolsena is the perfect example for environmentally-sensitive tourism in Italy. 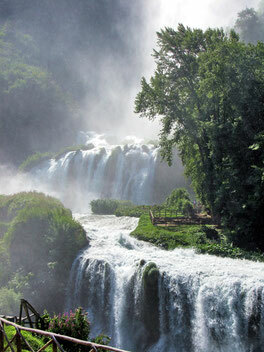 Marmore Falls is a true spectacle of nature. Described in Roman times and celebrated by the Grand Tour between 18th and 19th centuries, the waterfall is the highest in Europe, with a heavy mass of water that rushes down for 165 metres with three jumps. The area around the waterfall is a natural park, with footpaths, wooden bridges, and ladders to climb alongside the waterfall. You can relax on the lawn, then go into the tunnel in the rock below the waterfall, or climb up to the top of Lord Byron scenic viewpoint, from which you can enjoy an impressive view over the surrounding green valley. Coming back from Marmore Falls you can visit the beautiful Romanesque abbey called Abbazia di San Pietro in Valle, plunged in a beautiful countryside with hill-top towers. Directly connected to Spoleto centre through the Towers Bridge, Monteluco stands east of the city with its 760 metres above the sea level. It is possible to reach the top of the hill following the "Franciscan Path". A place of silence and meditation, Monteluco saw the birth of the hermitage movement in the sixth century. Nowadays, Monteluco is an ideal destination for a short trip, there is a traditional restaurant, barbecue areas and the old Convent of Saint Francis. 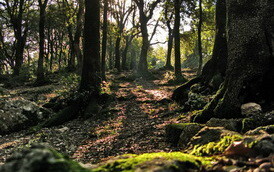 This green valley follows the river Nera, that runs cool and clear between the woods and high rock walls. 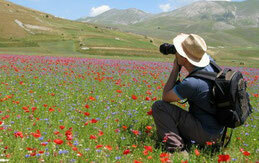 It is a territory rich in natural beauty where man is the spectator of this enchanting scenery. Ancient Abbeys (Abbazia di San Pietro in Valle, Chiesa dei Santi Felice e Mauro) appear on hidden corners of the valley and fascinating stone hamlets (Vallo di Nera) stand on the mountain sides with their towers and churches. Outdoor sports like biking, riding and rafting are practiced in this area.